I’m sure I’m not alone in saying that I was hugely disappointed when a Hellboy reboot was announced; not because I dislike the character or comic, on the contrary, Hellboy is probably my favorite ‘superhero’ — for me, it’s Big Red’s inner struggle that makes him immensely relatable. I was disappointed because this new film signaled the end of acclaimed filmmaker Guillermo del Toro’s proposed Hellboy trilogy, with Hellboy II: The Golden Army (2008) wrapping up on multiple dangling threads. So I, like many others, was clamoring to see a third and final chapter, closing out del Toro’s projected narrative (seriously, there was an online petition to finish off the series at one point), and this ‘fresh adult remake’ heralded the end of that dream. As saddened as I was, I was ready to judge this Hellboy retelling on its own terms and merits — every film, no matter how unjustified, deserves a chance. Helmed by English genre-nerd Neil Marshall — best known for the claustrophobic female-driven nightmare The Descent (2004), and having also worked on a bunch of action-heavy Game of Thrones episodes — and set to embrace the comics’ darker, horror-driven roots, Hellboy ’19, at a minimum, seemed to be trying something a little different. … here to raise hell. However, with the film’s media screening so close to its release, and the embargo lifting hours before opening to the general public, I feared the worst — an unconfident distributor, a shoddy production or both. And then the reviews come out, with Hellboy debuting on review aggregation site Rotten Tomatoes with a paltry 9% — that’s as low as 2004’s outrageously bad Catwoman. Reading the many criticisms thrust against the picture, it’s clear that Hellboy, as an IP, is really quite niche — people either don’t get the character, are too unfamiliar with the source material (it’s not a Marvel or DC property), or simply don’t dig obscure cinematic grotesqueries. Before getting into the nitty-gritty, let’s address one of the film’s biggest ‘evils’ according to the press — it’s bloatedness. True, there’s a lot of movie shoved into Hellboy’s 121 minutes — on that, I agree. The editing is also a bit choppy (which doesn’t help), but this could be due to the ‘apparent’ behind-the-scenes turmoil between Marshall, star David Harbour and producers Lawrence Gordon and Lloyd Levin. Irrespective, anyone who knows anything about Hellboy can tell you that, as a straight-up adaptation (even with its kitchen-sink approach), this thing coughs up the blood-soaked goods, honoring the spirit and mythos of Mike Mignola’s seminal work. Stay the hell out of their way. The film takes its cues from an eight-part anthology titled The Wild Hunt (issues #37 to #44 in the ongoing Hellboy saga), written by the great Mike Mignola and illustrated by Duncan Fegredo, first published in 2008-09, and, much like the movie, it delves into Authurian lore/ legend, while featuring a side-plot that sees HB bash the crap out of three gnarly flesh-eating goliaths. 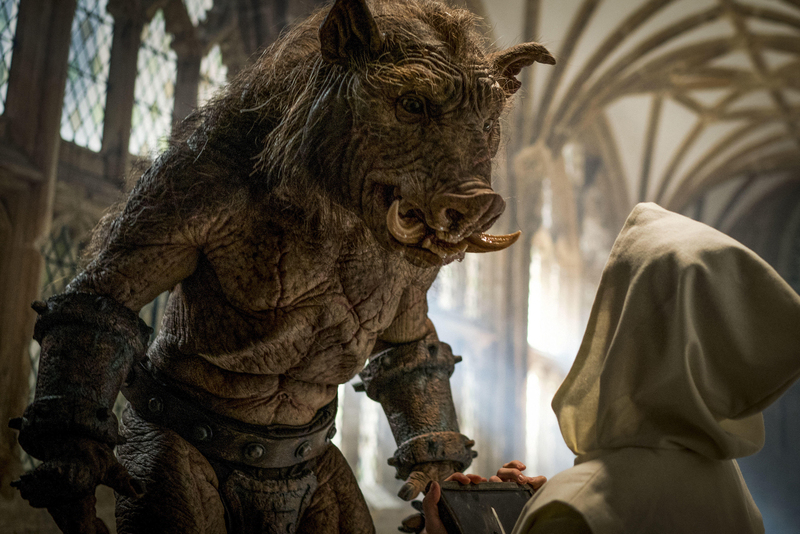 And it’s this same yarn that reunites Hellboy with Alice Monaghan (Sasha Lane) — whom our antihero rescued as an infant from fairy changeling Gruagach (Stephen Graham), an anthropomorphic boar who now seeks vengeance on the titular man-beast for past humiliations. Oh, and it pits Mr. Right Hand of Doom against nefarious enchantress Nimue, the ‘Queen of Blood,’ the flick’s chief nastie. So yes, I’d say it’s pretty faithful and accurate as a big-screen take. Perhaps a lengthier runtime would’ve helped fill in the blanks for non-diehards (which seems to be everyone I speak to), or maybe Lionsgate/ Millennium Media should’ve handed Marshall a larger budget given the film’s scope and scale (it’s said to have cost somewhere around $50 million U.S.). Snippets of other stories, such as a brief origin sequence and a flashback to a short titled The Corpse could’ve probably been omitted; but what the hell, this latest Hellboy plays out like a crimson-colored love letter to Mignola’s rich, exhaustive spectral universe, peppered with Marshall’s stylistic touches, and nods to ’80s fantasy/ horror classics such as Excalibur (1981) and Lifeforce (1985) — fans of cult cinema will gooble up all its ghoulish, gory goodness. 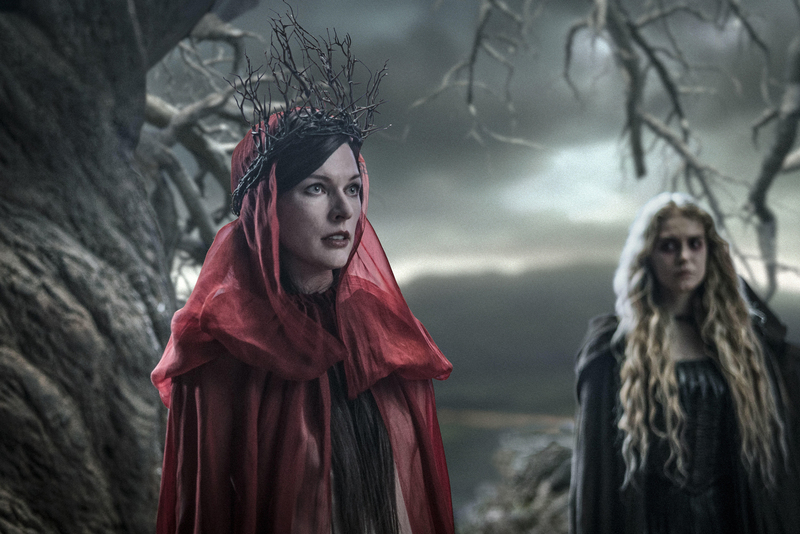 Penned by telly writer Andrew Cosby (who, all things considered, has done an okay job), the picture opens with a stylized black-and-white prologue set during the age of King Arthur — and the introductory shot, of a crow, ferociously tearing out the eyeball of a rotting corpse, more than sets grim the tone. It’s here, up on Pendle Hill, where we learn that fifth-century sorceress Nimue, the Blood Queen (Milla Jovovich), and her army of mythical creatures, is preparing to unleash all sorts of apocalyptic chaos onto mankind until she’s viciously betrayed by her coven, dismembered (quite graphically) by Merlin (Mark Stanley) and King Arthur (Brian Gleeson), who scatter her severed remains across Europe. Granted, we’re given a ton of exposition, narrated by Ian McShane’s Trevor Bruttenholm, aka Professor Broom, which does, unfortunately, feel awfully rushed — there’s almost too much to wrap one’s head around. We then cut to present day, Tijuana, where we meet David Harbour’s cussing red brute, Hellboy, who’s in search of a missing comrade, having vanished some time ago while staking out a vampire nest in Mexico. Of course, things end bloodily, and the hulking half-man, half-demon goes MIA. He’s eventually located and dragged back to the Bureau for Paranormal Research and Defense (B.R.P.D.) in America by his adoptive father, McShane’s Professor Broom, who’s much crankier than John Hurt’s earlier incarnation. Time to send in the big gun. Needless to say, Hellboy doesn’t stay put for very long, as he’s speedily sent to England, agreeing to meet with the secret Osiris Club, who need his aide with a ‘giant problem.’ And, like a bat out of hell, Hellboy finds himself smack-dab in the middle of an age-old conflict between man and monster, having one foot in both worlds. But, in order to do what’s ‘right,’ and stop the newly resurrected Nimue from blanketing the earth with torments of hell, he’ll have to team up with M-11 agent Ben Daimio, a face-scarred, creature-hating military man (Daniel Dae Kim), and former pal Alice, who’s now a spirit medium — cue the bone-splintering, jaw-tearing, head-splitting mayhem. Beneath all the ripped limbs and splattering insides (Hellboy has been stamped with an R18+ rating here in Australia), this is the story of a powerful, (mostly) well-meaning cambion trying to find his place in the big, bad world, which, let’s be honest, del Toro’s duology explored better. Still, there’s a lot to enjoy in Hellboy ’19 — the film, punctuated with dark humor, has a real Gilliamesque flavor, echoing much of the work of the ex-Monty Python man. 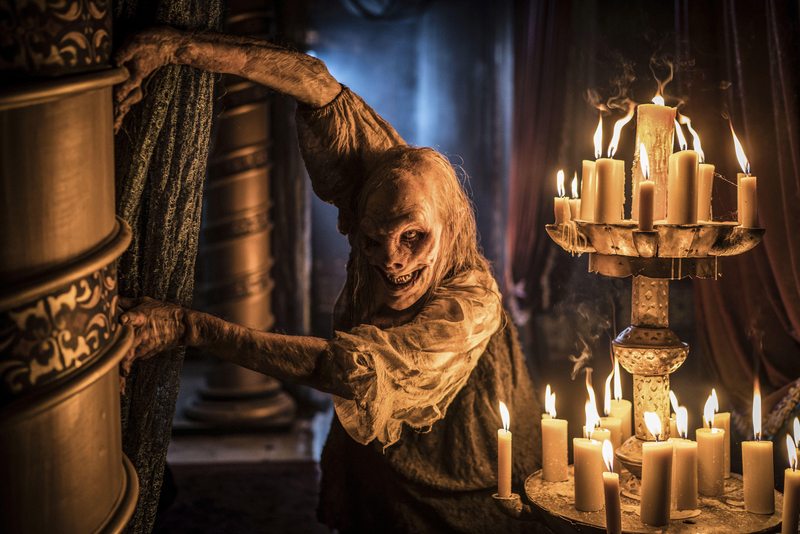 A sequence where Hellboy makes a deal with a hideous one-eyed witch named Baba Yaga (played ‘Twisty’ Troy James and voiced by Emma Tate), whom he banished to a snowy realm some time ago, is deliciously disturbing, the bits inside her moving chicken-legged ‘hut’ some of the flick’s finest, and most frightening. I’ve also got to mention a gruesome segment where several oversized Silent Hill-looking demons crawl out from a hole in the ground to shred, skin and slaughter a number of hapless Londonites in some truly horrific ways, this montage one of the most shocking things I’ve seen in a mainstream film for quite some time. Distant relative of Meg Mucklebones? To speak of the devil, Stranger Thing’s David Harbour does a solid job under layers of red prosthetics as the eponymous big fella himself whom Ron Perlman famously portrayed over a decade ago. Similarly, despite the casting controversy, Daniel Dae Kim, Lost (2004-10), is quite good as Japanese-American special ops guy Ben Daimio, a part that was initially given to Ed Skrein before he dropped out due to claims of whitewashing. Plus, it’s great to see the pulpy 1930’s vigilante Lobster Johnson up on screen, played by none other than Thomas Haden Church. 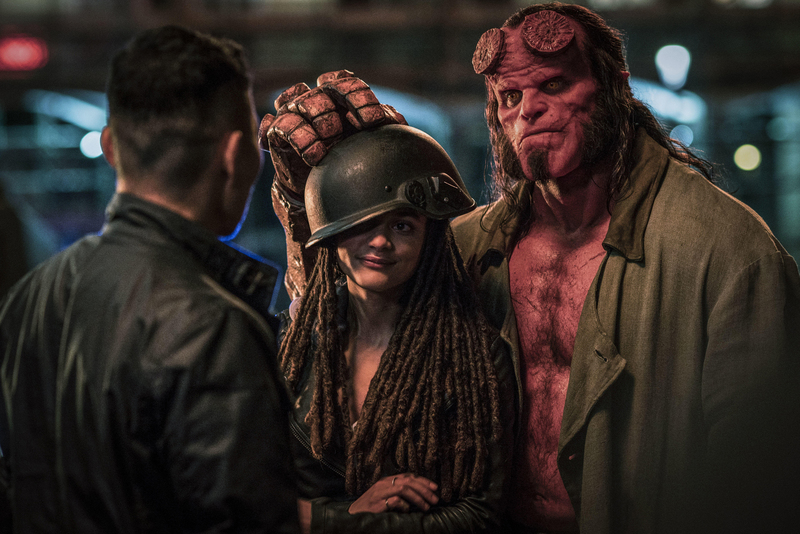 For anyone with a melting-pot passion for sickly twisted carnage, Neil Marshall’s Hellboy might be just the ticket, offering enough thrills, chills and kills to satisfy. 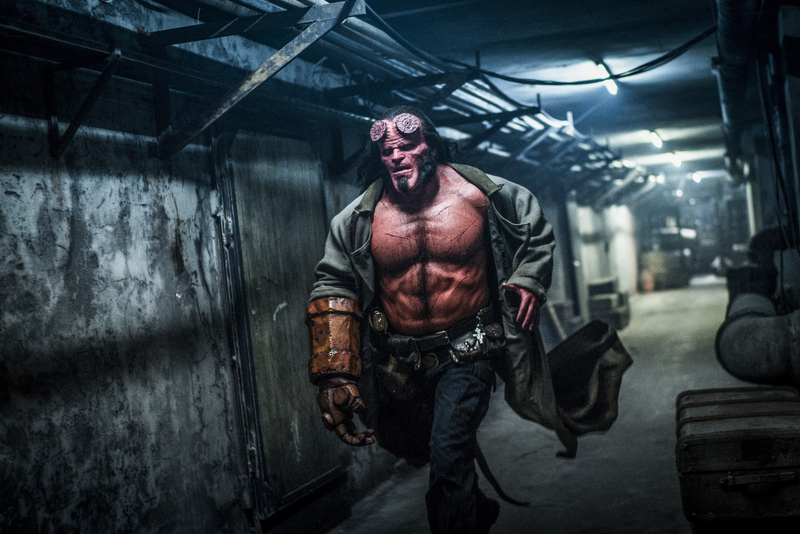 While it’s not as ‘visionary’ as del Toro’s The Golden Army, Hellboy ’19 is still one helluva manic ride — I’ll go out on a limb and say that I loved it. Unfortunately, given its dismal reviews and so-so reception, we may never get to see Koshchei the Deathless cause havoc up on the silver screen, who’s teased in one of the film’s in-credit stingers — and that’s sinful stuff!